Elements Of Power: Holding Back the "Cruise Missile Cultists"
Holding Back the "Cruise Missile Cultists"
I just know they're coming....a nefarious faction of the Opponents of Long Range Strike. Sheesh. First at SNAFU, we get a winners and losers list with the B-2 and Tomahawks reversed and on the wrong lists (Sorry Solomon - I still love ya' bud). It gets linked to AvWeek's Ares' Blog 'Frago' post which also links to a doozy at Information Dissemination which in turn has an extract from, and link to, a cruise missile puff piece at National Defense Magazine . Time for a short course in economics and the application of long range strike. This is the first air campaign (using the term loosely) that I've not been at least a small part of since 1991, or a significant contributor to since 1999. Between moi' and the sources above I'm probably the only person who has actually launched and tested cruise missiles, as well as understands their strengths and limitations. I'm also probably the only one to have done long range strike 'bang-for-buck' analyses and what-if scenarios for DoD campaign planning efforts and/or wrote his Master's thesis or capstone on the subject of the proper methodology for top-level conceptual design of next generation LRS platforms. Lesson 1. There is no ONE best weapon for everything and cruise missiles are only the one best weapon at attacking a very small subset of the total target set in any conventional (non-nuclear) campaign. There are efforts to make them more effective against a wider subset of targets but that will add cost and probably complexity to their designs. The very best subset of targets for conventional cruise missiles are taking out 'soft' nodes of Integrated Air Defense Systems and Command and Control networks/Power Grids. They are 'enablers' that allow the non-stealthy aircraft in the force-mix to operate more freely over the battlefield and do that killing hoodoo-that-they-do so well....instead of getting shot down before their 'magic' happens. Valuable? Within a narrow confine, yes. Wonder-weapon? No. Lesson 2. Cruise missiles are VERY expensive.... unless you never use them or if you use them, you won't miss them. Complexity costs money, and increases the probability of failure. The farther and longer a system has to operate to get to the target, the more the system is likely to fail on the way (see TLAM in Desert Storm note in the slides below). Lesson 3. 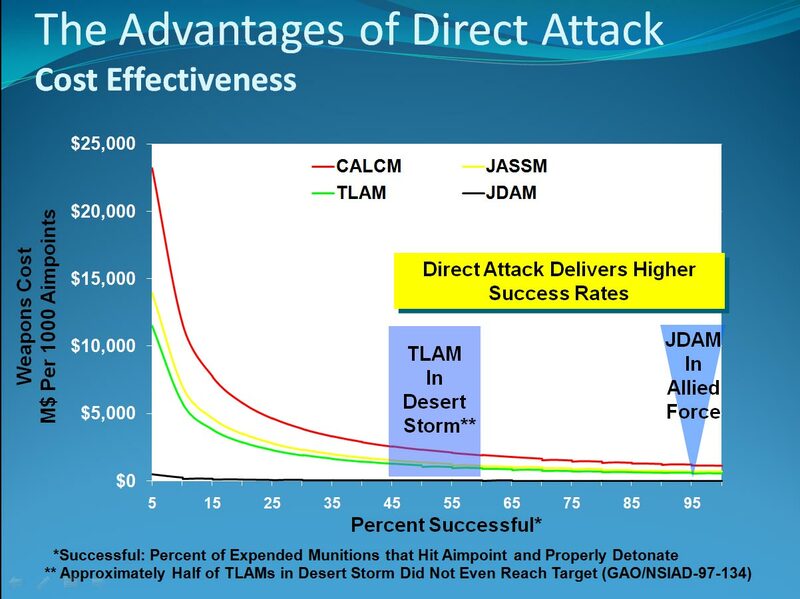 As long as the attrition rates are low enough, (and they don't even have to be THAT low) Direct Attack is ALWAYS cheaper and more effective than stand-off attack even if standoff attack has a PERFECT success rate. I've dusted off and sanitized an extract of publicly available and unclassified data from a circa-2000 briefing I gave after Operation Allied Force. The exact dollars are 'off' now, but the relationships remain the same. Cruise Missiles are orders of magnitude more expensive to operate than using precision direct attack. BTW: These charts were all based upon 2000lb JDAM usage. Smaller JDAMs would be relatively cheaper and just as,or more, effective than TLAM Tomahawks. The TLAM accuracy and reliability have improved since Desert Storm, but it doesn't make any difference. It is a more complex machine than a JDAM, and must operate reliably for a much longer period of time. 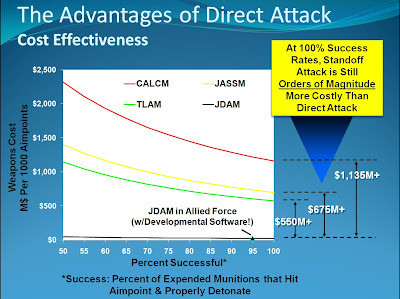 That line waaaay down at the bottom is the JDAM cost line. The cruise missiles are so expensive their real value comes in reducing risk to other systems: use as necessary - and no more. In Operation Allied Force, the B-2 was dropping JDAMs using developmental software and it still had a 95% hit rate. The B-2 had the highest percentage of first-pass 'kills' of all the aircraft employed. These dollar figures were probably mid-late FY 1990s when I used them in 2000. I notice TLAMS are even more expensive now, but JDAM kits are as well I suppose. As I noted at SNAFU in the comments, prices are very sensitive to lot buy quantities. 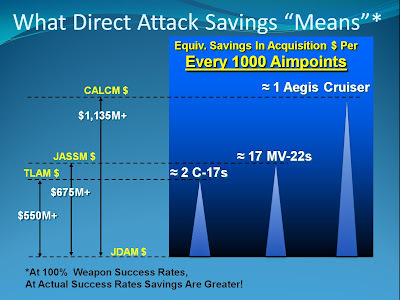 So even if cruise missiles were 100% successful, and even if all aimpoints were suitable for cruise missiles, what would you spend your savings on using JDAMs?